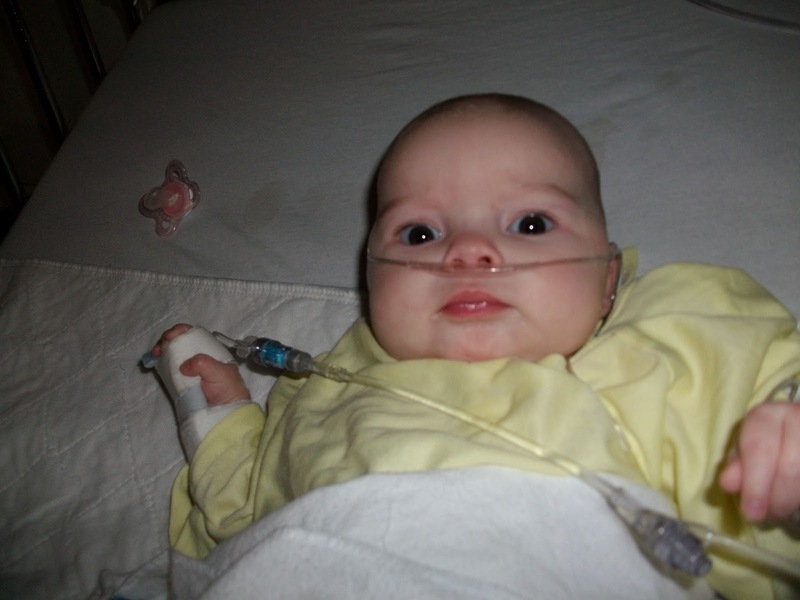 Nearly three years ago, when Hannah was 2 months old, she got sick. It started with a stuffy nose. Baby's noses get stuffy. We suctioned, this was kid number 4 a stuffy nose was nothing to get excited over. However her symptoms progressed and soon she had a yucky cough. So we took her to the doctor. Our doctor looked Hannah over and said it looked like a cold. But, just to be safe she sent us over to the hospital to have her swabbed for rsv. The results came back negative and so we went home. Hannah continued to get worse, she was now sleeping strictly in her car seat so we could keep her head elevated. We did everything we knew to do to keep our little baby from getting bronchitis or pneumonia. She continued to cough, mostly just at night, slept almost constantly and her appetite began to drop. I kept the car seat next to my side of the bed and slept very little, checking constantly to make sure Hannah wasn't gagging between coughs. 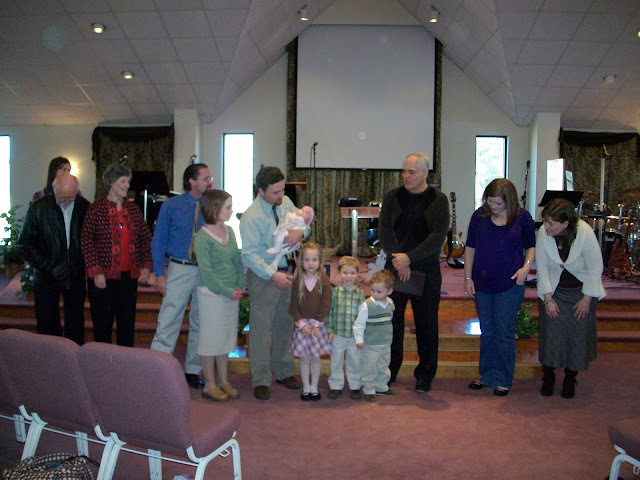 We went to Fredericksburg one weekend to have Hannah dedicated at my parent's church and then a baby shower. They prayed over her at Journey Church that Sunday morning. Anxious moms gathered around Hannah later that afternoon, concerned. Several of them tried in vain to get her to eat. Most of them begging me to have her taken back to the doctor. I assured them she had another appointment the very next day at home. That night, in the middle of the night Hannah did begin to gag. We were back home now. She was once again next to me - propped up in her little car seat. I woke my husband up in the middle of the night and told him that Hannah was so congested she was having a hard time breathing. Immediately he was up and had he and Hannah in a steamy bathroom, the shower water on as hot as it would go. I reminded him we had an appointment with our doctor first thing that morning. But that still being 7 hours away, Jarrod decided she couldn't wait. In between her coughs her skin was turning blue. Breathing had become very difficult for Hannah, her cries were quiet and when she was not working to breath she was sleeping. Jarrod set out around 2:00 that morning for the nearest hospital 20 minutes away. She was monitored for awhile, another rsv test was done and came back negative. The emergency room doctor deciding there was nothing more to be done, told my husband we just needed to be suctioning her nose right before feedings (though feedings had become nearly non existent by this point and the doctor was informed of this) and sent in a nurse to, "show him how to do it." Father and patient were then sent home even though Hannah's blood oxygen level was 88 during her time in the ER. Jarrod called with the update on his way home and I WAS LIVID! We both knew enough to know that a blood ox of 88 was not good news. Jarrod called our family doctor and described his visit to the emergency room. She hesitantly called in a decongestant, there was not much they could give Hannah since she was so young. A few hours later we were all dressed, took our oldest to school and, not knowing what else to do, headed back to the nearest town to pick up the decongestant. I am SO thankful for the wisdom my husband displayed next. In the parking lot of HEB in Hondo, Texas Jarrod dropped his head and prayed a simple prayer for help. Neither of us were comfortable giving her the medicine, especially when the doctor seemed so unsure herself. But we felt so lost. After his prayer Jarrod drove us to McDonald's. He told me how ridiculous he felt with our baby struggling just to breath and here we were headed in for burgers and playtime. He felt the Lord telling him, "Wait". We waited, the boys played. We picked at food, no interest in eating, and we waited. Jarrod had paged his aunt sometime earlier that morning. She is a pediatric nurse practitioner at a teaching hospital in California. Aunt Jonelle has been called too many times to remember for medical advise and we have come to really trust her judgement. As we sat in McDonald's obeying God's word, simply to wait, not knowing really what we were waiting for, the phone rang. Jarrod explained things to his Aunt, she recommended we take her to a hospital in San Antonio for a second opinion. We wasted no time throwing away nearly whole hamburgers and loading three kids into the car. An hour later we were in a small room at Methodist Children's hospital. 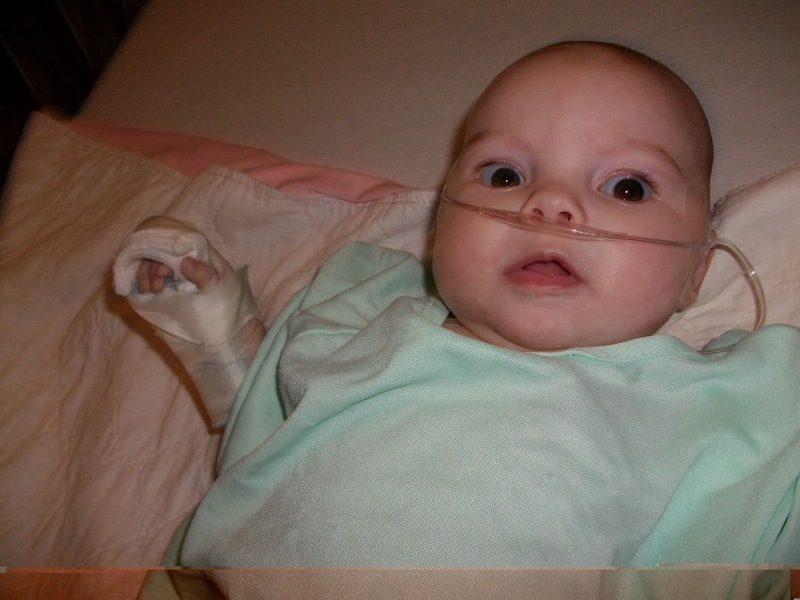 Hannah was on oxygen, and had tested positive for rsv. We had not even had a chance to sign our baby in before a nurse had glanced at her, rushed us through the doors, calling her an emergent case, and immediately getting the oxygen mask on her. She spent a week in the hospital and received excellent care. It took me nearly that entire week to "get over" how poorly Hannah had been treated at the other ER. To fathom how we got two negative rsv results, one of them just hours before the positive test. Oh to be so mature and confident in the Lord's work in every detail of our lives. I wish I functioned with a lot more foresight and a lot less hindsight. Weeks later, when I would look back at the events before Hannah's hospitalization, I would see so clearly God's hand. I shared with Jarrod some of these new insights and in the midst of the conversation it hit me, and I told him. "Really if you look at it this way you really can't be offended with anyone." You see, if Hannah's rsv tests had come back positive, like they clearly were. If the emergency room doctor in that tiny hospital in Hondo had been concerned about her blood oxygen level and admitted her, there we would have stayed. In a small town hospital not equipped to handle such serious respiratory problems as our sweet Hannah was experiencing. Methodist Children's Hospital has a fantastic respiratory department. I am not sure she would have gotten better if we had not been in a bigger hospital that was designed strictly to care for children and babies. God's hand in things does not always look like I think it should. I would love for it to be obvious and seamless. But often times His hand is in the obnoxious co-worker, it is in the middle of a long line of traffic, a doctor who seems inept. He is in the midst of lost jobs, dwindling paychecks and sick family members - working, always working for our very best. Thank you Lord for using bad judgement and inaccurate tests to save my sweet baby's life! P.S. I LOVE comments! Please don't be shy! I will forever look like I am twelve. Oddly enough when I was twelve I was the oldest girl in the class and therefor more physically "mature" which, at twelve, makes you uncool. I make obnoxious jokes when I am nervous. I make more obnoxious jokes once I am comfortable in a situation. I was a pastor's kid growing up. Despite all of my efforts I married a pastor in the making (who has been involved in some form of ministry most of our marriage). 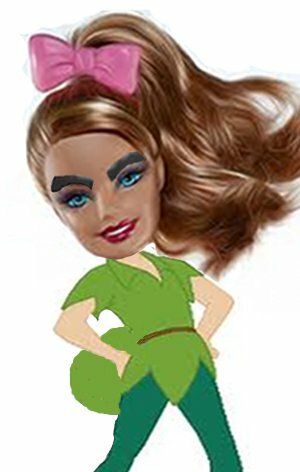 I have Groucho Marx eyebrows on barbie's face. I have JLo's rear end on Peter Pan's body. I was homeschooled from Junior High to graduation which made me a bit of an outcast. I'm 4'10... and 1/4" - - - I can't even see over people's heads to find the cool table. A few years ago one of our kids was having some medical issues and so we were driving an hour back and forth to and from San Antonio often. Because we seemed to spend more time in our car those days than we did at home we ate a lot of Mc Donald's and the boys became well acquainted with happy meals and happy meal toys. I don't remember what the theme for the toy was at that time but it was some sort of super hero thing. Our sons kept getting the same character over and over. We tried to soften the blow by showing excitement about the toy before passing it to the back seat of the van. On one occasion the boys had brought along a few Mc Donald's toys from previous meals (several of the same character). We stopped for happy meals and pulled out of the bag, none other than the famous match to their already growing stash. We talked it up big and passed it back. "What can I do with all of these?" Our older son, Isaiah, asked glumly. "I know, " I responded enthusiasticly. "Why don't you have them fight each other!" Because what good mother doesn't encourage violence when raising young boys. With pure joy Isaiah said, "ok". And immediately a fight broke out among his super heros. Elijah, his younger brother looked horrified and asked "Or could they just be friends?" Bless his sensitive heart. "Of course they can Elijah." I smiled and his super heros began to happily play together. I have always known our boys were different. To begin with they look nothing alike. Isaiah was blessed with my apparent eversion to growth and is also skinny with straight blond hair. Elijah is stocky with his daddy's dark brown curls. Things I took into account when buying clothes and planning hair cuts, but I was not considering their other differences when relating to them. Certainly I was not careful about how I talked to them or the things I said to them. Isaiah is a fighter, a protector. I am confident that if somebody were to break in and try to hurt one of us Isaiah would be armed and ready. He likes a playful punch on the arm, a sarcastic answer and a little rough housing to feel at home and loved! I speak that language well and can totally relate to him. Elijah, however, is sensitive - a peace maker, lover of all things! With him I have to be so careful. I have to reign in my dry sarcastic responses, tone down the teasing and throw a whole lot of cuddling into our play time. This is a life style I am not so familiar with (although I do love me some snuggle time) but it's what my little boy craves. It is my job as a mother to know my kids - to understand what drives them, encourages them, makes them feel secure. When I understand what motivates them I can more effectively discipline. I can be the mom they need individually rather than just - mom my way - take it or leave it! I can be a better friend, confidant, interim girlfriend, therapist, and teacher. I am so grateful I do not have two cookie cutter boys. They are 100% God fashioned for their very own purposes. I also love that I have had to stretch myself with these two individuals. It is impossible to be selfish and be a good mom. It is impossible to stay in your own comfort zone and be a good mom. It is impossible to be immoveable and be a good mom. I want to be a good mom and this requires change on my part! 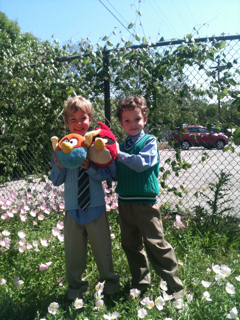 and of course their angry birds, it's not easter without some angry birds. My children chatted excitedly about their day at school while eating popcorn and drinking koolaid. We looked over report cards and gave high fives all around for another successful six weeks. 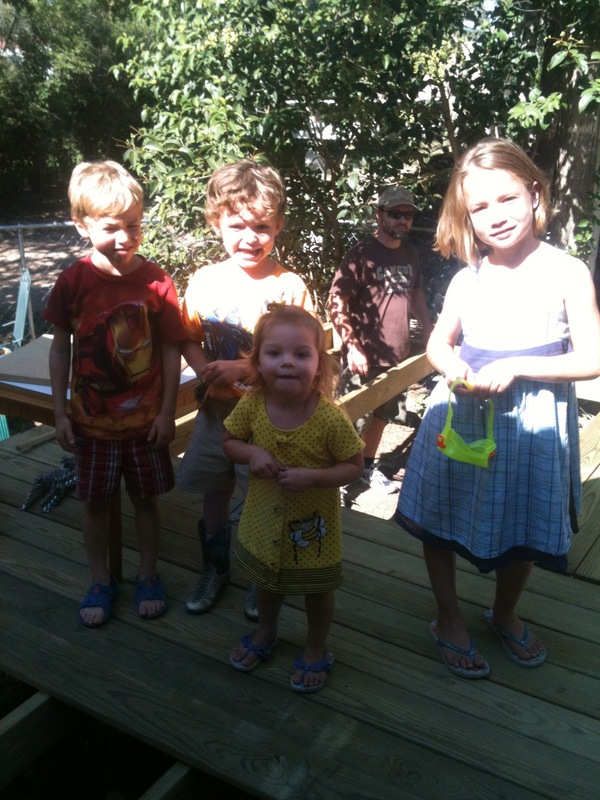 They quickly finished up homework and all four were out the back door to play until dinner time. My heart swelled. I never understood that statement until my kids began to do things to make my heart literally feel like it was doubling in size in order to contain all the joy I was experiencing. What fun it was having the kids home in the afternoons. There was joy, laughter, lots of excitement! I was a very happy mommy! I immediately took appropriate action and let the facebook world know what I was feeling. My status update, and I quote, " I love the way my house fills with noise and energy when my kids get home! They are AWESOME!" I hit post, smiled and sighed. And then I heard, "I am not!" Then kid number two, "Wahhhhhh!" Fights had broken out in twos and the kids were in the house, on the couch - learning to appreciate each other while holding hands. But something good came out of this. After all of that I still thought my kids were awesome, I was still loving having them home, and feeling blessed to be their mommy! This was huge! It was only a few short years ago that on our best days, during even the most precious moments I was wondering how I had ended up here and why in the world I was spending my life doing something so meaningless, raising kids. That's it, nothing really important. Stopping to take a look at my life and praise God for what he has given me is too often not a priority! And somedays I just flat out don't want to be thankful. In some ways this has been an icky year for us and I find it so easy to let that determine how I view the big picture. Have you ever had people in your life that you have done for and done for and done for and the first time you fail them it seems to be all they remember? Ugh, I hate that! I spend plenty of time on my computer, you would think between facebook and my blog, both of which I take a look at daily, I would keep the blessings of the Lord at the forefront of my mind. But I don't. God has really been dealing with me on this issue though, about where my focus is, what I am choosing to dwell on. Because of this I have a new project going in my house. My super duper sweet husband hung some poster board on a wall in our house. It is the perfect spot. I pass it often - with a few exceptions I can hardly walk into a different room in the house without seeing this wall. On it I am beginning to catalog the things I am thankful for - not just the day to day little things, although these are great too, but those miracles that God has done in our lives. Moments that have had us nearly, and sometimes literally, on our faces before God - praising Him because He is the only explanation for it! It is my wall of fame, if you will. (LORD, I have heard of your fame; I stand in awe of your deeds... Habakuk 3:2) A constant reminder of how rich our life is because of the Lord's great blessings! When I pass by it I remember what He has done and is capable of doing. Sometimes I shudder to think of where we would be without His great works in our life. Not the best picture. I am SO not an artist... but it gets the job done! If this doesn't help get my attention the next step is tattoos. Since I like me and I don't like pain, I am going to give my wall of fame a really good try! As I have already mentioned my marriage to Jarrod works really well! (click here for that post) It is simple and secure. This is, in large part, thanks to him. I would like to mention another little trick we have stumbled upon over the years. Once again, Jarrod earns the trophy for this one and anything I might contribute has been thanks to his example. Just Kidding, that would kind of defeat the purpose of this post. But as an example I love shoes, in theory. They are cute and fun and when you wear a children’s size like I may or may not (I’ll never tell) they can be fairly economical. In reality I HATE shoes and they are off my feet the minute I realize I am home and don’t have to be wearing them. Sometimes this is right at the back door. Other times on the floor in front of the couch. Often times under the kitchen table, and I don’t even realize I have taken them off. Sometimes I think I should just get an extra long table cloth and that could just be my closet. It sure would make the chances of finding my shoes in the morning increase. Unfortunately one of Jarrod’s pet peeves is, shoes strewn all over the house. Hmmm, what a predicament. Along similar lines are the chores. Wether you set down and divvied them up or they just became assumed over the years most partners have at least a few chores that are “assigned”. In our house my husband shows off his big strong muscles by taking out the trash... sometimes. Other times he forgets, often he is at work and the trash can overfloweth and the diaper is way to stinky to leave sitting out for the next 4 hours. In the early years of our marriage this use to bug me to no end. I’d go to throw something away, open the lid of the thrash can and be reminded for the dozenth time that day, “Oh yea, the trash can is full.” Then the agrivated thoughts would come up all over again. “Couldn’t Jarrod tell that it was nearly full on his way out the door for work this morning, remember that I am 13 months pregnant and take it out?” This lasted for awhile until I had the brilliant idea to take the bag out of the trash can myself, tie it up nice and tight and fling it on the floor next to the back door, (which sure showed him even though he was not there to witness my tantrum) for him to take out later. One day in the midst of building a trash bag pile in the corner of the kitchen, (yes we are incredibly wasteful people who throw away an alarming amount of stuff in one day) something ocucrred to me. Jarrod left the house early this morning, after packing his own lunch, getting his own water bottles filled, and kissing me good-bye as I snuggled down into our nice warm bed. And I was angry because he had the nerve to not go lift the lid on the trash can predict how much we would throw away and take out the trash as a precautionary move. The nerve! Maybe Jarrod didn’t notice the trash can. Maybe, just maybe he wasn’t trying to make our marriage miserable and uncomfortable by going on strike and refusing to take a bag out of the trash can. Could it be? I did a little experiment. I pulled the liner out of the trash can, tied it up and walked a few feet to the big trashcan outside. And you know what, I lived to tell about it! I began to do this more and more. Instead of the resentment towards Jarrod growing like I thought it would, it slowly and quietly died. There were no more mazes of full trash bags lining the back of the kitchen, reminding me of how I had been “wronged”. I did not have to smell stinky diapers hanging in a grocery sack on the back door knob. The really crazy part, I don’t think Jarrod noticed one way or another. He had been so clueless that the trash was such a problem in our marriage that he did not even know it was something that needed to be fixed. I had gotten mad at him for no good reason, I got upset when he did not read my mind or take my hints and I let it fester. I began to apply this new thought to all those little pet peeves that I had. Was Jarrod trying to tick me off by leaving clothes next to the bed or could it be that it was the most convenient place to throw them after a long day at work? In a short matter of time I found myself going through my day smiling as I worked around a pile of clothes in my room. Reminding myself how lucky I am that my husband is willing to work until he is beyond tired so that I can stay home with kids. Taking out trash became just another thing I did when it needed to be done and Jarrod was not around. I have even been known to take out a bag or two when he is home but is in the middle of playing with a kid or his favorite team is playing football. As it turns out Jarrod has been doing this same sort of thing all along. He could have pitched a fit about shoes EVERYWHERE but he stepped around them or carried them to the closet if he was on his way. When you stop and realize, wether it is a spouse, a friend or, dare I say it, the person who cuts you off in traffic that likely none of these people woke up determined to ruin your day and likely are oblivious to the fact that they have. It makes showing a measure of grace and letting them “off the hook” a little easier. I love how my kids say things like, "Back when I was five..." You mean like 6 months ago? I love how incredibly loudly my kids talk in the car and then when they are saying something to me from the back of the van they are incapable of talking above a whisper. I love that my daughter was so excited to get to sing "The Star Strangled Banner" over the PA at school today. I love that when my kids play house I ALWAYS have to be Grandma. I love that the ONLY time my kids ever remember to flush the toilet is when I am in the shower. I love finding poop in an unflushed toilet but no sign of toilet paper. And how could I not love these gorgeous faces! My daddy just stopped by! It is always such a treat when he shows up at our house. Especially after 5 years of living 2 and at one time 5 hours away, I am loving the closeness that allows us a quick face to face visit whenever we want. We were talking about something completely unrelated to yesterday's presidential election, but after my dad left my wandering mind couldn't help thinking of that and applying these two thoughts where my own concerns are - regarding this country. Whether the person you voted for will be in the White House next year or not I think most of us would agree our country is lacking in some areas. This generally idealistic girl here has her own anxieties about where we are headed. So today I believe the Holy Spirit spoke to me, through the words of my father. My dads words hit their intended target with regards to what we were discussing but also brought clarity to this situation as well. When doubts, when anger, when anxious feelings and all the "what ifs" rise up and tell me we are in trouble as a nation and there is no way out, I am to take those thoughts captive. Not to grab hold of them and let them control my day. But to confiscate them and if they are not lining up with what God says throw them out! So I will take these thoughts captive, but what then? I was so excited when I looked up 2 Corinthians 10:5. The words Paul spoke just before telling us to take our thoughts captive were exactly what I believed God had already been sharing with me. I believe there are stronghold on us today, I fear our freedom to worship may be at risk. I see our freedom of speech slipping away a little bit more everyday. I tell you, I have wanted to storm through some doors on more than one occasion. It is time to be Bold as believers - bold and strong. We can wage war and be effective. I have the power, and also authority to storm the gates of hell. We all know who our fight is ultimately against anyway. We are the light in a world that is slipping rapidly into darkness. The freedom we have to fight this darkness can never be taken away from us. Remember who your fight is against. As you beg for mercy for this country also ask for mercy and grace to fight - as this dark world is always watching us. One last thing I can do is this. I can encourage other Christ followers so that we do not lose hope. This next passage is lengthy but amazing, I encourage you to read it. Is anybody besides me sick of hearing about my “medical problems”? Maybe this will be the last time for awhile. I have done so much griping here about it that I thought I should at least share some good news for a change. After 5 months of joint pain, muscle pain, muscle weakness, tremors, muscle jerks, and fatigue, we seem to be making progress and getting answers. It only took 1 family doctor, 2 specialists, 12 vials of blood, 3 x-rays, 4 different medications, a nerve study, a muscle study a few thousand dollars and an MRI to come to 1 very simple conclusion. I have a herniated disc that is putting pressure on the spinal cord. This in turn makes for some angry nerves and explains just about everything. I am kind of wishing we had worked backwards and started with the neurologist and MRI. I am waiting for a consult with a Neurosurgeon in San Antonio to see what needs to be done. In the mean time I am supposed to avoid activities above eye level. Umm... I’m 4’10” unless I am tying my shoes it’s pretty much all above eye level. (actually she said to try to keep my neck in a neutral position) I am also suppose to avoid accidents like falling which is really going to put a cramp in my style. But I’ll do my best. Though the thought of surgery of any kind, I HATE having surgery, does not sound very fun. Especially not fun when you are allergic to nearly every pain killer known to man. I love the idea of this being such a simple fix. No life long medications, no scary diseases, no life altering conditions! Thank you Jesus! The neurologist was not 100% sure but felt fairly confident that this could be our answer. And who knows, maybe the surgeon will decide surgery isn’t needed and some sort of physical therapy would be beneficial. Either way, yay for answers and doctors who are willing and desire to help patients and get to the bottom of things! Our family doctor thought a few weeks ago that all the crazy bizarre symptoms I have been having (click here to if you want to catch up) were starting to sound like they might be more neurological than rheumatological. So in addition to the check ups with the rheumatologist I started seeing a neurologist. She did an exam and ordered a nerve study and muscle study. I waited a week, went back to the office, had the nerve study. Then waited 6 more days, went back for a muscle study and results from both. She said my nerves are beautiful (what do you know, I really am beautiful from the inside out) ;) My muscle study was normal on the machine. AND she told me three times how strong my arm muscles are (please pass along that last bit of info to all who know me, I really think that kind of thing just needs to be shared... Sarah Brook's has confirmation from a doctor, NICE ARM MUSCLES!) But in the midst of the muscle study my arm started doing the funky muscle jerk my muscles do. The neurologist saw it, and then tried to get it to happen again. She could make the arm muscle relax and contract by pushing on my elbow. This was frustrating to her as it was not showing up on the study but she could see it happening with her own eyes. She decided to order an MRI of the neck (interesting experience, you can read about that here). Had to wait another 6 days to do that. Waited patiently all this week to hear those results. I finally called her office today to find out if they had seen the MRI yet. The nurse called back and said they do have the results, she definitely sees some issues with my neck but wants to see the actual films. They will call me when they get those. Hmph! More waiting. I have to say I am getting better at waiting. However, if all of this has just been so God could to teach me patience I'd rather learn the lesson in a line, maybe at Disney World, or a pizza buffet!